Every hotel of the not-huge variety seems to call itself a boutique hotel. But what does this term actually mean? 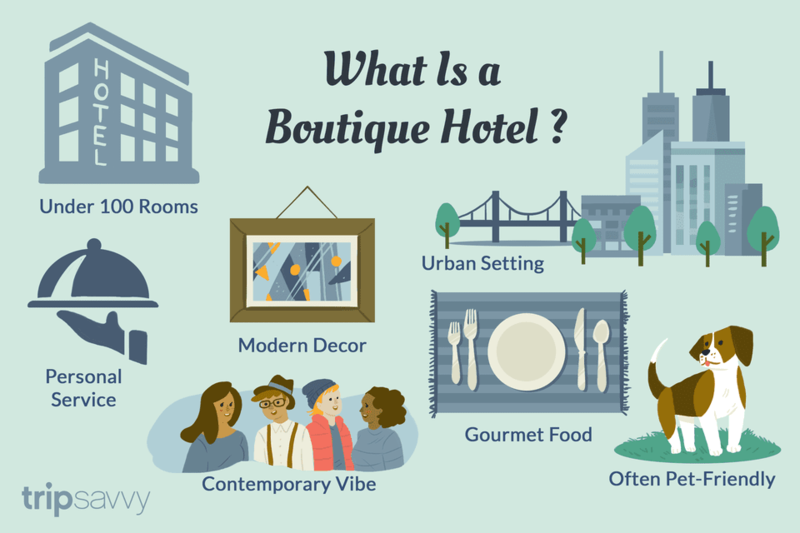 Leaving the hype and buzz aside, what is exactly is a boutique hotel? Unlike the open-to-interpretation meaning of luxury hotel, the definition of a boutique hotel is pretty clear. Here are some elements that typically separate a boutique hotel from other lodging options. A boutique hotel's clientele is individualistic, too, appealing to guests who shy away from cookie-cutter décor and business hotels. It has a contemporary vibe and a quirky, modern spirit. Boutique hotels are not stuffy. Their décor is typically modern and often cutting-edge, featuring stark palettes with bold color splashes. Fussy, glitzy furnishings are not boutique-hotel hallmarks. A boutique hotel can surprise and delight guests with winsome touches: a tiger-shaped faux-fur rug before the fireplace; a chocolate treat shaped like your first initial; your own (and not very corporate) temporary business cards. It's rich in local flavor. Often, the small size of an urban boutique hotel affords it a stylish, dead-center location in the heart of town, and its spirited ambiance suits its lively location. You'll find boutique hotels in fashionable resort towns, too. But whether urban or rural, a good boutique hotel reminds you of where you are. Often, it conveys a strong sense of place and pride in its location's heritage. It focuses on food and beverage. You can count on a boutique hotel to house an outstanding restaurant and bar that draw a city-wide crowd. (The hotel's eatery may be run by a celebrity chef.) A boutique hotel often offers a stylish bar or lounge with a modern cocktail menu and regional wines. It's friendly to four-legged travelers: Boutique hotels tend to have fewer rules and restrictions than bigger, more conventional hotels. Many, perhaps most, boutique hotels are very pet-friendly, welcoming your furry friend. The Point in upstate New York occupies a onetime Adirondacks lakefront lodge built by the Rockefeller family. Its 11 sunny rooms are filled with antiques and creature comforts (almost every room has a wood-burning fireplace). As a Relais & Châteaux hotel, The Point has a special emphasis on dining with ultra-gourmet meals, an ultra-high-end open bar, and nightly cocktail party. The Jefferson, an elegant neoclassical structure in Washington, D.C., is dedicated to the third U.S. President Thomas Jefferson, a bon vivant and philosopher. His namesake hotel is laden with the kind of French furniture that "TJ" collected, and its Plume restaurant and bar serve newer vintages of the Madeira wines he relished. Inn of the Five Graces in Santa Fe, New Mexico is set in adobe homes that constitute the United States' oldest neighborhood, built during the conquistador era of the late 1500s. The hotel's 24 suites are all different, decorated with antique furniture and rugs from the Southwest, Bali, India, and Morocco. The bathrooms are works of art, covered with mosaic designs. Once a convent, Monastero Santa Rosa is now one of southern Italy's most upscale hotels. It hugs a cliff on the magnificent Amalfi coast, and the windows and terraces of its 20 handsome, sunny rooms frame unforgettably rosy sunrises. Virtually every guest amenity here is locally produced, from the restaurant's wine and olive oil to the lusciously fragrant room soaps. Carcassonne, France, is Europe's most famous medieval fortress town, and Hotel de la Cité is set within its high stone walls, offering painting-like views. The hotel's 60 rooms and suites, built more recently (the early 1900s) combine their era's beauty and grace with cutting-edge tech. The in-house restaurant is a French feast that pours hard-to-get southwestern French wines. The 60 guest "pavilions" (rooms) at Phulay Bay Ritz-Carlton Reserve in southern Thailand come with a lavish indoor-outdoor bathroom suite, a plunge pool, and a private butler who knows what you want before you do. Every detail of this resort pleases the senses, from the futuristic spa to the beach lapped by the Andaman Sea's turquoise waters.